The Australian custard apple industry, based on Annona spp., has existed in Australia for approximately 70 years, with rapid expansion occurring over the last 20 years. Annual production has been valued at $11M, and production is forecast to double during the next five years from increased plantings. However, exports markets have failed to increase (for a number of reasons not pertinent here), and current domestic consumption is now either static or declining. Substantial over-supply in domestic markets is a real possibility. 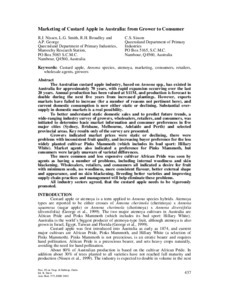 To better understand static domestic sales and to predict future trends, a wide-ranging industry survey of growers, wholesalers, retailers, and consumers, was initiated to determine basic market information and consumer preferences in five major cities (Sydney, Brisbane, Melbourne, Adelaide and Perth) and selected provincial areas. Key results only of the survey are presented. Growers indicated market prices were static or declining, there were problems with inconsistent fruit quality, and increasing buyer preference for the less widely planted cultivar Pinks Mammoth (which includes its bud sport: Hillary White). Market agents also indicated a preference for Pinks Mammoth, but consumers were largely unaware of varietal differences. The more common and less expensive cultivar African Pride was seen by agents as having a number of problems, including internal woodiness and skin blackening. Wholesalers, retailers, and consumers all indicated a desire for fruit with minimum seeds, no woodiness, more consistent flavour, better external shape and appearance, and no skin blackening. Breeding better varieties and improving supply chain practices and management will help eliminate these problems. All industry sectors agreed, that the custard apple needs to be vigorously promoted.